This is a series which continues to redefine the standards by which these works should be performed. As before, the music spans most of Mozart’s life, from 1763—when he was just seven years old—to 1782, and (another) unfinished present written for his new wife Constanze. In the spring of 1764, Mozart’s first published compositions were issued in Paris: two volumes each containing a pair of sonatas for harpsichord and violin. Their title page described them as Sonates pour le Clavecin qui peuvent se jouer avec l’Accompagnement de Violon (‘Harpsichord sonatas which can be played with the accompaniment of a violin’). Their author was described as ‘J C Wolfgang Mozart de Salzbourg, Agé de Sept ans’. In fact Mozart had recently celebrated his eighth birthday, but some of the music contained in the sonatas had originated in the previous year, shortly after the Mozart family embarked on their extended European tour. Several of the movements from the sonatas are found in the form of solo piano pieces entered in the musical notebook which was presented to Mozart’s elder sister, ‘Nannerl’, by their father in 1759. Adding a violin part to a pre-existing keyboard piece was literally child’s play, and in the case of the earliest sonata included here, the Sonata in B flat major, K8, the opening movement was adapted from a piece which Mozart entered in Nannerl’s notebook shortly after the family arrived in Paris, in November 1783. A few awkward switches between major and minor were ‘corrected’ in the published version, but the keyboard parts are otherwise identical. Following a graceful slow movement, the sonata ends with a pair of minuets, the second of them, with its jagged ‘dotted’ rhythm, in the unusual key of B flat minor. The Mozarts set off from Paris on 10 April 1764, and arrived in London nearly a fortnight later. On 27 April Mozart and his sister played to King George III and Queen Charlotte at Buckingham House, and it was the Queen who commissioned Mozart’s next group of sonatas, K10–16. This time, the title-page (though not the music itself) made allowance for the use of a flute in place of a violin, and some copies also had a cello part, so that the pieces could be performed as trios. The Sonata in F major, K13, is notable for its precociously expressive slow movement in the minor. The piece is essentially based on a single theme, played at the outset by keyboard and violin in imitation, and has an unusually elaborate development section. The minuet finale features slithering chromatic scales in which the two instruments echo each other by inversion. The trio (or second minuet) is another affecting piece in the minor, again plumbing depths remarkable for a composer of such tender age. Mozart’s next group of sonatas with violin, K26–31, was composed in The Hague in February 1766, and dedicated to Princess Caroline, the daughter of William IV of Orange. The Sonata in E flat major, K26, is alone in the series in being cast in three movements, rather than two. Its energetic opening movement is highly condensed, and after a brief development section culminating in C minor the music wrenches itself abruptly back into the home key, omitting the main subject’s opening stage altogether. A sudden switch between the same two keys occurs at two moments during the course of the finale. The first of them is preceded by a brief flurry of counterpoint based on the main rondo theme, and involving both instruments. The C minor slow movement highlights the contrast between the angular ‘dotted’ rhythm of its opening bars and the smoother phrases that follow. Mozart draws particular expressive value out of the flattened second degree of the scale—a ‘Neapolitan’ tinge that lends the music a haunting quality. The opening movement of the Sonata in C major, K28, finds Mozart making a return to the pervasive use of ‘Alberti’ left-hand figuration in constant semiquavers. All the same, the brilliance of the piece, with its sustained trills, is tempered by its unusual tempo marking of allegro maestoso. The finale is a graceful allegro—not a rondo, but a sonata design. Following its miniature development section, Mozart again marks the return to the home key with a reprise not of the first subject (which is omitted), but of the second. As things turned out, Mozart didn’t begin to write his own set of six violin sonatas until early in the following year, by which time he had already been in Mannheim for some two months, and he only completed the series after reaching Paris in the spring of 1778. Among the Mannheim sonatas, the Sonata in C major, K303, is unusual in beginning with an adagio whose broad melody is given out by the violin before being handed over to the piano for an even more rhapsodic continuation. This is, however, no ordinary slow movement, but rather a sonata form whose various stages unfold in contrasting tempi. The opening adagio modulates towards the dominant key (G major), before breaking off with the music poised on the threshold of G minor. At this point an allegro begins, with a theme which modulates constantly, bringing with it at first a hint of the key of A minor. The entire allegro, indeed, has an agitated feel, and it conspicuously fails to establish any stable theme before a brief transition leads to a reprise of the adagio, which this time paves the way for a final return of the allegro in the home key. Perhaps because the first movement is so unstable, Mozart brings the sonata to a close with a minuet which, although in a highly personal sonata form, is entirely free of conflict. Rather than offer any genuine development, its second half is content to present the main subject in a form even more relaxed than at the start of the movement. No doubt for this reason, Mozart begins the recapitulation in the traditional Mannheim manner with the second subject, and follows it with an abbreviated reference to the first subject. At the end, this unpretentious piece fades gently away into the distance. In the early days of June 1781 Mozart at last freed himself from the service of the hated Prince-Archbishop of Salzburg and launched himself on a freelance career in Vienna. Naturally enough, he was anxious to establish his credentials in the city as both composer and pianist as soon as possible, and the easiest way for him to do so was through the popular medium of the piano sonata with violin. Already in May, at a time when he was in Vienna with the Archbishop’s retinue, Mozart had told his father that he was about to issue a set of six sonatas by subscription; but he must have heeded the advice of his Viennese friend Countess Thun, who assured him there was no use trying to sell anything by that method before the autumn, since everyone with any money had retired to their country residence. At any rate, the subscription plan was dropped, and on 4 July Mozart informed his sister that he was sending four sonatas to the engraver’s. Two of them—the sonata in C major, K296, and the B flat major, K378—had been composed some years earlier, but the other two were new. However, three weeks later Mozart had a further change of heart, and decided to revert to his plan of publishing a set of six sonatas. One of the four new works—K379—had been written in April, for a soirée given by the Archbishop; and Mozart hurriedly added the three remaining works, K376, 377 and 380. The complete set appeared in December 1781, under the imprint of the Viennese firm of Artaria. Mozart dedicated the six sonatas to his piano pupil Josepha von Auernhammer. She was clearly a pianist of considerable talent, and it was for her that Mozart composed his sparkling sonata for two pianos, K448. 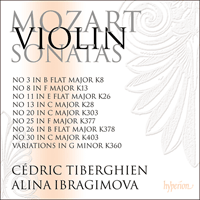 Of the six violin sonatas in her set of 1781, none begins in more energetic fashion than the Sonata in F major, K377. Its opening allegro owes its exhilarating effect to the fact that its driving triplet rhythm doesn’t pause to draw breath until the very last bar of each half of the piece. The vertiginous effect is enhanced by the music’s rising sequences—not only in the transition towards the exposition’s second stage, but also in the development section and the approach to the recapitulation. So concerned is Mozart not to interrupt the music’s dizzying flow that the recapitulation actually sets in at the apex of one of these rising sequences, with the spiralling pattern of ascending triplets which had been established during the development section absorbed into the violin’s accompaniment to the main theme; and to add emphasis to this moment the main subject is now played in canon by the pianist. Following the opening allegro’s frenetic activity, the measured tread of the D minor slow movement’s variation theme comes as a welcome relief. The theme itself is a close relative of the more expansive, siciliano-like subject Mozart used two years later for the variation finale of his D minor string quartet, K421—the second in the series he dedicated to Haydn; and when, in the last of the violin sonata’s six variations, the theme is transformed into an actual siciliano, the resemblance between the two pieces is unmistakable. In both, moreover, the concluding variation is preceded by one in which the music turns from minor to major, casting a glow of warmth over the proceedings. (The sonata’s major-mode interlude is rendered the more effective by following, as it does, a stormy variation complete with rushing scales.) In the sonata, as in the string quartet, the theme’s second half culminates in an expressively enhanced ‘Neapolitan’ cadence passing through the chord of the flattened second degree of the scale. 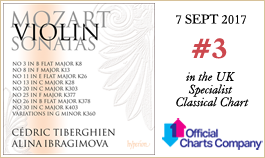 In the quartet Mozart loses sight of this exotic tinge following the first variation, but in the sonata he maintains it throughout, adding emphasis to it in the coda which follows the siciliano sixth variation. The finale is a gentle minuet whose understated simplicity may remind us of the ‘Tempo di menuetto’ last movement from the piano concerto, K413, in the same key of F major. Framing the piece is an actual minuet whose two halves each have a written-out repeat in which the piano’s melodic line is doubled an octave higher by the violin. Its short phrases are separated by silences which curiously leave the music as though suspended in mid-air. Between this calm outer framework, the material is more continuous and animated; and the figuration of the middle portion of the piece is echoed in a coda containing a hint of a cadenza. At the end, a long-sustained trill at the top of the keyboard acts as a background to a suggestion of horn-calls in the pianist’s left hand, and, in double-stops, on the violin, before the piece sinks to a quiet conclusion. Nothing is known of the origin of the fine Sonata in B flat major, K378, but Mozart probably composed it in or around 1779, while he was still living in Salzburg. Although it is not without its moments of brilliance, its opening movement is a broad and largely relaxed affair, with an admirable sense of give-and-take between the players. If for the greater part it is the piano that leads and the violin which answers, it’s worth noting that the spacious main theme is followed by a yearning new idea, passing briefly through the key of G minor, initiated by the violin. The second subject, with its minor-mode tinges, offers a foretaste of the turn to the minor which occurs with the onset of the development section. Here, the piano spins a melancholy new theme whose continuation passes to the violin; and if we may feel that the following agitated crossed-hands passage for the piano rather overstays its welcome, with at least one harmonic sequence too many, Mozart makes amends with a condensed recapitulation in which the violin seizes the initiative after only four bars. Having treated piano and violin very much as equals in the opening movement, Mozart allows the stringed instrument to take a back seat at the opening of the slow movement. The piano’s theme here, striving upwards with subdued passion, is given out against a background of triplets which conflicts with the melody’s duple rhythm. Formally, the piece is highly original, with the middle section and reprise fused into a continuous whole. That middle section begins with an unremarkable violin theme which, however, takes wing in its second half with a much more expressive continuation, before the music comes to an unresolved halt, and the violin takes over the movement’s opening theme. Only once this has run its course does the piano assume command once more, with a rerun of the middle section in which the instruments’ previous roles are reversed. In order to ensure the music’s seamless flow, this quasi-repeat begins with the more ornate second half of what had been the middle section’s new theme, but the omitted first half is reserved, in a still plainer form, for the start of the coda. The finale’s heading of ‘rondeau’ provides a pointer to the fact that this is to be a piece in the French style, involving changes in metre. Its opening pages, with their G minor middle section invoking a hint of siciliano rhythm, are notated in a pattern of three quavers to the bar. They give way to an allegro in four beats, whose repeated-note patter brings with it a whiff of opera buffa. In the reprise the opening material is even more dance-like than hitherto, with the music’s lilt at one point underlined by a violin accompaniment in pizzicato chords. In the same letter of July 1781 in which Mozart told his sister he was about to publish a group of sonatas for piano and violin, he also mentioned that he had completed three sets of variations. We can’t be sure about their identity, but the most likely candidates all have a French source: the variations for solo piano on a theme from Grétry’s opera Les mariages samnites (K352), and two sets for piano and violin on melodies from collections put together by the castrato and composer Égide-Joseph Albanèse: La bergère Célimène (K359), and Auprès [or Au bord] d’une source (K360). The Variations in G minor, K360, remain popularly known as ‘Hélas, j’ai perdu mon amant’—an invented label, but one that perhaps fits the music’s melancholy mood rather better than the actual title of Albanèse’s air. The only change Mozart made to the original melody was to transpose it from E minor into a more pathetic G minor. In the theme and first variation the violin acts as accompanist, but it emerges into the foreground in the strikingly chromatic second variation, whose lilting rhythm stresses the melody’s siciliano-like character with gentle pathos. Following the more forceful next variation, variation 4 has groups of rippling semiquaver triplets alternating between the two instruments, while the penultimate variation sees the melody transformed into the major. At the end of the last variation, with its fleeting arpeggios, the music seems to disappear into a hole at the bottom of the keyboard. In the summer of 1782, shortly after he married Constanze Weber, Mozart embarked on a series of sonatas for piano and violin intended as a gift to his new wife. However, like so much of the music he wrote for Constanze, including the great C minor Mass, K427, the sonatas were destined to remain unfinished. Mozart’s manuscript of the Sonata in C major, K403 (it bears the heading, ‘Sonate première. Par moi W A Mozart pour ma très chère Epouse’), breaks off shortly after the start of its finale, and the remainder of the last movement, including a substantial development section unfolding largely in the minor, was supplied by the composer and music historian Maximilian Stadler, who completed several of Mozart’s fragmentary pieces following his death. The work was first published in 1830, under the title of ‘Sonate facile’. The C major sonata shows Mozart in an experimental frame of mind. Its easy-going opening subject achieves greater intensity at the start of the recapitulation, where the violin’s statement turns to the minor, introducing a lengthy developmental passage. At the start of the slow movement the piano’s phrases are punctuated by a gentle descending arpeggio-like motif on the solo violin. Following the opening subject Mozart introduces a soaring, passionate new idea in the minor, and thereafter the music remains in the minor almost throughout. A development of the arpeggio motif gives way to a lengthy chromatic passage which leaves the music poised on the threshold of A minor, before a short modulatory link leads directly into the theme of the allegretto finale. Au printemps 1764, les premières compositions éditées de Mozart furent publiées à Paris: deux volumes contenant chacun deux sonates pour clavecin et violon. Leur page de titre les décrivait comme des Sonates pour le Clavecin qui peuvent se jouer avec l’Accompagnement de Violon. Leur auteur était présenté comme «J C Wolfgang Mozart de Salzbourg, Agé de Sept ans». En fait, Mozart avait récemment fêté son huitième anniversaire, mais une partie de la musique contenue dans les sonates avait vu le jour l’année précédente, peu après le début d’une longue tournée européenne de la famille Mozart. Plusieurs mouvements de ces sonates se trouvent sous la forme de pièces pour piano seul notées dans le carnet de musique offert à la sœur aînée de Mozart, «Nannerl», par leur père en 1759. L’adjonction d’une partie de violon à la pièce pour clavier préexistante était un véritable jeu d’enfant et, dans le cas de la sonate la plus ancienne enregistrée ici, la Sonate en si bémol majeur, K8, le premier mouvement était adapté à partir d’une pièce que Mozart ajouta au carnet de musique de Nannerl peu après l’arrivée de la famille à Paris, en novembre 1783. Quelques passages maladroits du majeur au mineur furent «corrigés» dans la version publiée, mais pour le reste les parties de piano sont identiques. Après un mouvement lent élégant, cette sonate se termine par deux menuets, dont le second, avec son rythme «pointé» irrégulier, est écrit dans la tonalité inhabituelle de si bémol mineur. Les Mozart quittèrent Paris le 10 avril 1764 et arrivèrent finalement à Londres une quinzaine de jours plus tard. Le 27 avril, Mozart et sa sœur jouèrent pour le roi Georges III et la reine Charlotte à Buckingham House et c’est la reine qui commanda le groupe suivant de sonates de Mozart, K10–16. Cette fois, la page de titre (mais pas la musique elle-même) prenait en considération l’utilisation d’une flûte à la place d’un violon, et certaines copies comportaient aussi une partie de violoncelle, si bien que ces pièces pouvaient être jouées comme des trios. La Sonate en fa majeur, K13, est remarquable pour son mouvement lent en mineur d’une force expressive précoce. Cette pièce repose essentiellement sur un seul thème, joué au début par l’instrument à clavier et le violon en imitation, et comporte un développement exceptionnellement élaboré. Le menuet final comporte des gammes chromatiques ondulantes dans lesquelles les deux instruments sont en écho l’un par rapport à l’autre, par inversion. Le trio (ou second menuet) est une autre pièce émouvante en mineur, sondant une fois encore des profondeurs remarquables pour un compositeur aussi jeune. Mozart composa le groupe suivant de sonates avec violon, K26–31, à La Haye en février 1766, et le dédia à la princesse Caroline, la fille de Guillaume IV d’Orange. La Sonate en mi bémol majeur, K26, est la seule de la série qui est coulée en trois mouvements, au lieu de deux. Son mouvement initial énergique est très condensé et, après un bref développement culminant en ut mineur, la musique retourne brusquement dans la tonalité d’origine, en omettant complètement la phase initiale du sujet principal. Un changement soudain entre les deux mêmes tonalités survient à deux moments au cours du finale. Le premier est précédé par un bref accès de contrepoint basé sur le thème principal du rondo et impliquant les deux instruments. Le mouvement lent en ut mineur souligne le contraste entre le rythme «pointé» saccadé de ses premières mesures et les phrases plus régulières qui suivent. Mozart tire une valeur expressive particulière du second degré bémolisé de la gamme—une nuance «napolitaine» qui donne à la musique un caractère lancinant. Dans le premier mouvement de la Sonate en ut majeur, K28, Mozart revient à une utilisation omniprésente de la basse d’«Alberti» à la main gauche en doubles croches ininterrompues. Tout de même, l’éclat de ce morceau, avec ses trilles soutenus, est tempéré par son indication inhabituelle de tempo, allegro maestoso. Le finale est un allegro gracieux—pas un rondo, mais un plan de sonate. Après son développement miniature, Mozart revient à nouveau à la tonalité d’origine avec une reprise non pas du premier sujet (qui est omis), mais du second. Il se trouve que Mozart ne commença à écrire son propre recueil de six sonates pour violon et piano qu’au début de l’année suivante, époque à laquelle il avait déjà passé environ deux mois à Mannheim, et il n’acheva l’ensemble de la série qu’après son arrivée à Paris au printemps 1778. Parmi les sonates de Mannheim, la Sonate en ut majeur, K303, est inhabituelle car elle commence par un adagio dont la large mélodie est exposée par le violon avant de passer au piano pour une suite encore plus rhapsodique. Mais il ne s’agit pas d’un mouvement lent ordinaire, plutôt d’une forme sonate dont les diverses phases se déroulent dans des tempos contrastés. L’adagio initial module vers la tonalité de la dominante (sol majeur), avant de s’interrompre comme suspendu au seuil de sol mineur. Commence alors un allegro, avec un thème qui module constamment, amenant tout d’abord avec lui une touche de la tonalité de la mineur. En fait, tout l’allegro a une atmosphère agitée et ne parvient pas à établir de façon évidente le moindre thème stable avant qu’une courte transition mène à une reprise de l’adagio qui, cette fois, ouvre la voie à un retour final de l’allegro dans la tonalité d’origine. C’est peut-être parce que le premier mouvement est si instable que Mozart mène cette sonate à sa conclusion avec un menuet qui, même s’il est écrit dans une forme sonate très personnelle, est libéré de tout conflit. Au lieu de proposer un vrai développement, sa seconde moitié se contente de présenter le sujet principal sous une forme encore plus détendue qu’au début du mouvement. C’est sans doute la raison pour laquelle Mozart commence la réexposition à la manière traditionnelle de Mannheim avec le second sujet et le fait suivre d’une référence abrégée au premier sujet. À la fin, ce morceau sans prétention s’éteint doucement dans le lointain. Au début du mois de juin 1781, Mozart se libéra enfin du service du prince-archevêque de Salzbourg qu’il détestait et se lança dans une carrière indépendante à Vienne. Naturellement, il tenait beaucoup à s’affirmer le plus vite possible comme compositeur et comme pianiste dans cette ville, et la manière la plus facile de le faire consistait à avoir recours au moyen d’expression en vogue de la sonate pour piano avec violon. Déjà en mai, à une époque où il était à Vienne avec l’escorte de l’archevêque, Mozart avait dit à son père qu’il était sur le point de publier un recueil de six sonates en souscription; mais il dut tenir compte du conseil de son amie viennoise, la comtesse Thun, qui lui garantit qu’il était inutile de vendre quoi que ce soit selon cette méthode avant l’automne, car quiconque avait de l’argent s’était retiré dans sa résidence à la campagne. En tout cas, le projet de souscription fut abandonné et, le 4 juillet, Mozart informa sa sœur qu’il envoyait quatre sonates chez le graveur. Deux d’entre elles—la sonate en ut majeur, K296, et la sonate en si bémol majeur, K378—avaient été composées quelques années plus tôt, mais les deux autres étaient nouvelles. Toutefois, trois semaines plus tard, Mozart changea à nouveau d’idée et décida de reprendre son projet de publication d’un recueil de six sonates. Il avait écrit l’une des quatre nouvelles œuvres—K379—en avril pour une soirée donnée par l’archevêque; et il ajouta en toute hâte les trois autres œuvres, K376, 377 et 380. Le recueil complet parut en décembre 1781, édité par la firme viennoise Artaria. Mozart dédia les six sonates à son élève pianiste Josepha von Auernhammer. Elle avait manifestement un talent considérable et c’est pour elle que Mozart composa sa brillante sonate pour deux pianos, K448. Des six sonates pour violon et piano de son recueil de 1781, aucune ne commence d’une manière plus énergique que la Sonate en fa majeur, K377. Son allegro initial doit son effet exaltant au fait que son rythme endiablé en triolets ne marque aucune pause pour reprendre souffle avant la toute dernière mesure de chaque moitié du morceau. L’effet vertigineux est renforcé par les séquences ascendantes de la musique—non seulement dans la transition vers la seconde phase de l’exposition, mais également dans le développement et à l’approche de la réexposition. Mozart tient tellement à ne pas interrompre le flot vertigineux de la musique que la réexposition survient en fait au point culminant de l’une de ces séquences ascendantes, avec le motif en spirale de triolets ascendants qui avait été établi au cours du développement absorbé dans l’accompagnement de violon du thème principal: et pour insister sur l’importance de ce moment, le sujet principal est maintenant joué en canon par le pianiste. Après l’activité frénétique de l’allegro initial, le pas mesuré du thème du mouvement lent en ré mineur vient comme un soulagement bienvenu. Le thème lui-même est un proche parent du sujet plus chaleureux en forme de sicilienne que Mozart utilisa deux ans plus tard dans le finale en forme de variations de son quatuor à cordes en ré mineur, K421—le deuxième de la série qu’il dédia à Haydn; et lorsque, dans la dernière des six variations de la sonate pour violon et piano, le thème est transformé en une véritable sicilienne, la ressemblance entre les deux morceaux est indubitable. En outre, dans les deux œuvres, la dernière variation est précédée d’une variation où la musique passe du mineur au majeur, ce qui donne une douce sensation de chaleur à ce procédé (l’interlude en majeur de la sonate fait d’autant plus d’effet venant après, comme c’est le cas, une variation tumultueuse avec des gammes très rapides). Dans la sonate, comme dans le quatuor à cordes, la seconde moitié du thème culmine avec une cadence «napolitaine» mise en valeur de façon expressive par le biais de l’accord sur le second degré bémolisé de la gamme. Dans le quatuor, Mozart perd de vue cette nuance exotique après la première variation, mais dans la sonate il la conserve du début à la fin, lui accordant plus d’importance dans la coda qui suit la sixième variation en forme de sicilienne. Le finale est un doux menuet dont la discrète simplicité peut nous rappeler le dernier mouvement, «Tempo di menuetto», du concerto pour piano, K413, dans la même tonalité de fa majeur. Un véritable menuet encadre la pièce, menuet dont les deux moitiés sont chacune dotées d’une reprise écrite où la ligne mélodique du piano est doublée à l’octave supérieure par le violon. Ses courtes phrases sont séparées par des silences qui, curieusement, laissent la musique comme suspendue dans l’air. Au sein de cet encadrement extérieur calme, le matériel est plus continu et animé; et la figuration de la partie centrale de la pièce revient dans une coda qui contient un soupçon de cadence. À la fin, un long trille dans l’aigu du clavier sert de fond sonore à ce qui pourrait évoquer des sonneries de cor à la main gauche du piano et, en doubles cordes au violon, avant que le morceau sombre dans une calme conclusion. On ignore tout de l’origine de la belle Sonate en si bémol majeur, K378, mais Mozart la composa sans doute en 1779 ou vers cette date, quand il vivait encore à Salzbourg. Sans être dépourvu de moments brillants, son premier mouvement est vaste et largement détendu, avec une admirable impression de concessions mutuelles entre les deux instrumentistes. Si c’est en majeure partie le piano qui mène la danse et le violon qui répond, il est intéressant de noter que le spacieux thème principal est suivi d’une nouvelle idée languissante lancée par le violon qui passe brièvement par la tonalité de sol mineur. Le second sujet, avec ses touches en mineur, offre un avant-goût du véritable passage au mineur qui survient au début du développement. Ici, le piano expose un nouveau thème mélancolique qui passe ensuite au violon; et si l’on peut avoir l’impression que le passage agité qui suit, avec les mains croisées au piano, prolonge plutôt indûment sa durée, avec au moins une séquence harmonique de trop, Mozart s’amende dans une réexposition condensée où le violon prend l’initiative après seulement quatre mesures. Après avoir, dans une large mesure, traité le piano et le violon comme des égaux au cours du premier mouvement, Mozart laisse l’instrument à cordes s’effacer au début du mouvement lent. Ici, le thème du piano, à la pointe du combat avec une passion contenue, est exposé sur un arrière-plan de triolets qui sont en contradiction avec le rythme binaire de la mélodie. Sur le plan formel, ce morceau est très original, avec une section centrale et une reprise fusionnées en un tout continu. Cette section centrale commence par un thème quelconque au violon, qui décolle toutefois dans sa seconde moitié avec une suite beaucoup plus expressive, avant que la musique s’interrompe en l’absence de toute résolution; puis le violon revient au thème initial du mouvement. C’est alors seulement que le piano reprend les rênes, avec un retour de la section centrale où les instruments voient s’inverser leurs rôles précédents. Afin de préserver le flux ininterrompu de la musique, cette quasi reprise débute avec la seconde moitié plus ornée de ce qui était le nouveau thème de la section centrale, la première moitié omise étant réservée, sous une forme encore plus simple, pour le commencement de la coda. Le titre du finale, «rondeau», donne une indication sur le fait que ce doit être un morceau dans le style français, impliquant des changements de mètre. Ses premières pages, avec leur section centrale en sol mineur évoquant un soupçon de rythme sicilien, sont notées sur un schéma de trois croches par mesure. Elles font place à un allegro à quatre temps, dont le crépitement en notes répétées apporte un parfum d’opéra bouffe. À la reprise, le matériel initial ressemble encore plus à une danse que précédemment, le rythme de la musique étant souligné à un moment par un accompagnement de violon en accords pizzicato. Dans la même lettre de juillet 1781 où Mozart écrivit à sa sœur qu’il était sur le point de publier un groupe de sonates pour piano et violon, il mentionna aussi qu’il avait achevé trois séries de variations. Il est difficile de les identifier, mais il est probable qu’elles sont toutes d’origine française: les variations pour piano seul sur un thème de l’opéra de Grétry Les mariages samnites (K352) et deux séries pour piano et violon sur des mélodies tirées de recueils réunis par le castrat et compositeur Égide-Joseph Albanèse: La bergère Célimène (K359) et Auprès [ou Au bord] d’une source (K360). Les Variations en sol mineur, K360, restent communément connues sous le titre «Hélas, j’ai perdu mon amant»—étiquette inventée, mais qui correspond peut-être mieux à l’atmosphère mélancolique de la musique que le titre réel de l’air d’Albanèse. Le seul changement que Mozart apporta à la mélodie originale fut la transposition de mi mineur à sol mineur, plus pathétique. Dans le thème et la première variation, le violon sert d’accompagnateur, mais il émerge au premier plan dans la deuxième variation au chromatisme saisissant, dont le rythme cadencé souligne le caractère de sicilienne de la mélodie doucement pathétique. Après la variation suivante plus énergique, la quatrième présente des groupes de triolets de doubles croches en cascades qui passent d’un instrument à l’autre, alors que l’avant-dernière variation voit la mélodie transformée en mode majeur. À la fin de la dernière variation, avec ses arpèges rapides, la musique semble disparaître dans un trou en bas du clavier. Au cours de l’été 1782, peu après avoir épousé Constanze Weber, Mozart se lança dans une série de sonates pour piano et violon qu’il comptait offrir à sa nouvelle femme. Toutefois, comme tant de musique qu’il écrivit pour Constanze, notamment la grande messe en ut mineur, K427, ces sonates devaient rester inachevées. Le manuscrit de Mozart de la Sonate en ut majeur, K403 (elle porte le titre «Sonate première. Par moi W A Mozart pour ma très chère Epouse»), s’arrête peu après le début du finale et le reste du dernier mouvement, notamment un important développement qui se déroule largement dans le mode mineur, fut écrit par le compositeur et musicographe Maximilian Stadler, qui termina plusieurs pièces fragmentaires de Mozart après sa mort. Cette œuvre fut publiée pour la première fois en 1830, sous le titre de «Sonate facile». La sonate en ut majeur montre Mozart dans une disposition d’esprit expérimentale. Son sujet initial détendu prend davantage d’intensité au début de la réexposition, où le thème du violon passe en mineur, introduisant un assez long passage de développement. Au début du mouvement lent, les phrases du piano sont ponctuées par un doux motif descendant en forme d’arpèges au violon seul. Après le sujet initial, Mozart introduit une nouvelle idée passionnée et exaltante dans le mode mineur, et la musique reste ensuite en mineur presque jusqu’au bout. Un développement du motif arpégé fait place à un long passage chromatique qui laisse la musique au seuil de la mineur, avant qu’une brève modulation mène directement au thème du finale allegretto. Im Frühling 1764 kamen die ersten veröffentlichten Kompositionen Mozarts in Paris heraus: zwei Bände mit jeweils zwei Sonaten für Cembalo und Violine. Auf der Titelseite wurden sie als Sonates pour le Clavecin qui peuvent se jouer avec l’Accompagnement de Violon („Sonaten für Cembalo, die mit Violinbegleitung gespielt werden können“) angekündigt. Ihr Autor war angegeben als „J C Wolfgang Mozart de Salzbourg, Agé de Sept ans“. Tatsächlich hatte Mozart kurz davor seinen achten Geburtstag gefeiert, doch war ein Teil der Sonaten im Vorjahr entstanden, kurz nachdem die Mozarts sich auf ihre ausgedehnte Europa-Tournee aufgemacht hatten. Mehrere Sätze aus den Sonaten finden sich in Form von Klavier-Solostücken in dem Notenbuch für Nannerl wieder, welches Leopold Mozart 1759 für seine Tochter angelegt hatte. Einem bereits bestehenden Klavierstück eine Geigenstimme hinzuzufügen, war tatsächlich ein Kinderspiel, und in dem Falle der frühesten hier vorliegenden Sonate, die Sonate B-Dur, KV8, handelt es sich bei dem ersten Satz um die Bearbeitung eines Stücks, welches Mozart im November 1783, kurz nachdem die Familie in Paris eingetroffen war, in Nannerls Notenbuch eingetragen hatte. Einige ungeschickte Wechsel zwischen Dur und Moll sind in der veröffentlichten Version „korrigiert“, ansonsten sind die Klavierparts jedoch identisch. Nach einem anmutigen langsamen Satz endet die Sonate mit einem Menuettpaar, wobei das zweite einen eckigen, punktierten Rhythmus hat und in der ungewöhnlichen Tonart b-Moll steht. Die Mozarts verließen Paris am 10. April 1764 und es dauerte fast zwei Wochen, bis sie schließlich in London eintrafen. Am 27. April spielten Mozart und seine Schwester König Georg III. und Königin Charlotte im Buckingham House vor und es war die Königin, die den nächsten Sonatenzyklus, KV10–16, bei Mozart in Auftrag gab. Diesmal war auf der Titelseite (allerdings nicht im Notentext selbst) angegeben, dass anstatt einer Geige auch eine Flöte verwendet werden könne; zudem fand sich in einigen Exemplaren auch eine Cellostimme, so dass die Stücke als Trios aufgeführt werden konnten. Die Sonate F-Dur, KV13, ist aufgrund ihres frühreif expressiven, langsamen Satzes in Moll bemerkenswert. Das Stück basiert im Wesentlichen auf einem einzigen Thema, welches zu Beginn vom Tasteninstrument und der Geige in Imitation gespielt wird, und hat eine ungewöhnlich aufwendige Durchführung. Im Finale—ein Menuett—schlängeln sich chromatische Tonleitern durch beide Stimmen, wobei ein Instrument die Linie des anderen umgekehrt nachklingen lässt. Das Trio (oder zweite Menuett) ist ein weiteres anrührendes Stück in Moll, in dem wiederum Tiefen ausgelotet werden, die für einen Komponisten derart zarten Alters beachtlich sind. Mozarts folgende Serie von Sonaten mit Violine, KV26–31, entstand im Februar 1766 in Den Haag und ist der Tochter Wilhelms IV. von Oranien, Prinzessin Karoline, gewidmet. Die Sonate Es-Dur, KV26, ist das einzige Werk in der Gruppe, das nicht zwei- sondern dreisätzig angelegt ist. Der energische erste Satz ist äußerst verdichtet und nach einer kurzen Durchführung, die ihren Gipfel in c-Moll erreicht, wendet sich die Musik abrupt ab und kehrt zur Grundtonart zurück, wobei der Beginn des Hauptthemas ausgelassen wird. Ein plötzliches Wechseln zwischen denselben Tonarten findet an zwei weiteren Stellen im Finale statt. Der ersten geht ein kurzer und betriebsamer Kontrapunkt mit beiden Instrumenten voran, welchem das Hauptthema des Rondos zugrunde liegt. Im langsamen c-Moll-Satz wird der Kontrast zwischen dem eckigen, punktierten Rhythmus der Anfangstakte und den folgenden, geschmeidigeren Phrasen herausgearbeitet. Besondere Ausdruckskraft gewinnt Mozart aus der erniedrigten zweiten Stufe der Tonleiter—ein „neapolitanischer“ Anklang, der der Musik eine besondere Eindringlichkeit verleiht. Im ersten Satz der Sonate C-Dur, KV28, setzt Mozart durchgängig den sogenannten „Alberti-Bass“ ein—Figurationen der linken Hand in konstanten Sechzehnteln. Gleichwohl wird die Brillanz des Stücks mit seinen anhaltenden Trillern durch die ungewöhnliche Tempo-Bezeichnung „Allegro maestoso“ gemäßigt. Das Finale ist ein anmutiges Allegro—kein Rondo, sondern ein Sonatensatz. Nach der verkürzten Durchführung zeigt Mozart die Rückkehr zur Grundtonart mit einer Reprise nicht des ersten Themas (welches ausgelassen wird), sondern des zweiten an. ich schicke meiner schwester hier 6 Duetti à Clavicembalo e Violino von schuster. ich habe sie hier schon oft gespiellet. sie sind nicht übel. wen ich hier bleibe, so werde ich auch 6 machen, auf diesen gusto, dann sie gefallen sehr hier. ich schicke sie ihnen hauptsechlich nur, damit sie sich in Zweyen Divertiren können. Letztendlich dauerte es aber noch bis Anfang des folgenden Jahres, nachdem er bereits zwei Monate in Mannheim verbracht hatte, bevor Mozart mit der Arbeit an sechs eigenen Violinsonaten begann und er schloss die Werkreihe erst im Frühling 1778, nach Ankunft in Paris, ab. Unter den Mannheimer Sonaten ist die Sonate C-Dur, KV303, insofern ungewöhnlich, als dass sie mit einem Adagio beginnt, dessen weitgefasste Melodie von der Violine präsentiert, bevor sie an das Klavier weitergereicht wird, welches sie sogar noch rhapsodischer fortsetzt. Es handelt sich dabei allerdings um keinen herkömmlichen langsamen Satz, sondern eher um einen Sonatensatz, dessen Abschnitte sich in unterschiedlichen Tempi entfalten. Das Adagio zu Beginn moduliert zur Dominante (G-Dur) hin, bevor es abbricht und die Musik auf der Schwelle zu g-Moll balanciert. In dem Moment beginnt ein Allegro, dessen Thema ständig moduliert und zunächst einen Anflug von a-Moll mit sich bringt. Tatsächlich hat das gesamte Allegro eine bewegte Atmosphäre und es ist auffällig, dass sich kein stabiles Thema einstellen will, bevor eine kurze Überleitung in eine Reprise des Adagios führt, das diesmal eine letzte Rückkehr des Allegro in der Grundtonart vorbereitet. Vielleicht weil der erste Satz so instabil ist, schließt Mozart die Sonate mit einem Menuett ab, das zwar eine äußerst persönliche Sonatenform aufweist, jedoch völlig konfliktfrei ist. Anstatt mit einer echten Durchführung aufzuwarten, wird in der zweiten Hälfte lediglich das Hauptthema präsentiert, und zwar in noch entspannterer Weise als zu Beginn des Satzes. Sicherlich aus diesem Grunde eröffnet Mozart die Reprise in traditionell Mannheimer Manier mit dem zweiten Thema, worauf er eine verkürzte Anspielung auf das erste Thema folgen lässt. Am Schluss entschwindet dieses bescheidene Stück sanft in die Ferne. Anfang Juni 1781 befreite Mozart sich schließlich von den Fesseln des Dienstes für den ihm verhassten Erzbischof in Salzburg und begann seine Karriere als freischaffender Musiker in Wien. Natürlich wollte er sich in der Stadt so schnell wie möglich sowohl als Komponist wie auch als Pianist etablieren, und am einfachsten konnte dies mithilfe des beliebten Mediums der Klaviersonate mit Violinbegleitung erreicht werden. Bereits im Mai, als er sich mit dem Gefolge des Erzbischofs in Wien aufgehalten hatte, hatte Mozart seinem Vater mitgeteilt, dass er einen Zyklus von sechs Sonaten auf Subskriptionsbasis herauszugeben gedenke, doch muss er dann den Rat seiner Wiener Freundin, Maria Wilhelmine von Thun und Hohenstein, beherzigt haben, die ihm versichert hatte, dass es sinnlos sei, etwas auf diese Weise vor dem Herbst verkaufen zu wollen, da alle wohlhabenden Menschen sich auf ihre Landgüter zurückgezogen hätten. Wie dem auch sei, das Subskriptions-Vorhaben wurde aufgegeben und am 4. Juli benachrichtigte Mozart seine Schwester, dass er vier Sonaten „in Stich geben“ werde. Zwei davon—die Sonate C-Dur, KV296, und B-Dur, KV378—waren einige Jahre zuvor entstanden, doch die anderen beiden waren neu. Drei Wochen später entschied Mozart sich allerdings erneut um und ging zu seinem Plan zurück, einen Zyklus von sechs Sonaten herauszugeben. Eines der vier neuen Werke, KV379, hatte er im April für eine Soiree des Erzbischofs komponiert; die drei übrigen Werke, KV376, 377 und 380, wurden in Eile hinzugefügt. Der vollständige Zyklus kam im Dezember 1781 bei dem Wiener Verlag Artaria heraus. Mozart widmete die sechs Sonaten seiner Klavierschülerin Josepha von Auernhammer. Sie muss eine äußerst begabte Pianistin gewesen sein, da Mozart für sie auch seine strahlende Sonate für zwei Klaviere, KV448, komponierte. Von den sechs Violinsonaten von 1781 beginnt keine energischer als die Sonate F-Dur, KV 377. Der erste Satz wirkt aufgrund eines vorantreibenden Triolenrhythmus, der erst im jeweils allerletzten Takt der beiden Satzhälften Luft holt, besonders anregend. Dieser atemberaubende Effekt wird durch die aufsteigenden Sequenzen der Musik noch verstärkt—nicht nur in der Überleitung zum zweiten Teil der Exposition, sondern auch in der Durchführung und in der zur Reprise führenden Passage. Mozart ist so sehr darum bemüht, den schwindelerregenden Strom der Musik nicht zu unterbrechen, dass die Reprise sogar auf dem Gipfel einer jener aufsteigenden Sequenzen einsetzt, wobei das spiralförmige Muster aufstrebender Triolen, das erstmals in der Durchführung vorkam, in die Violinbegleitung des Hauptthemas aufgenommen ist. Und um diesem Moment noch mehr Nachdruck zu verleihen, wird das Hauptthema nun vom Pianisten im Kanon gespielt. Auf das frenetische Allegro folgt willkommene Entspannung in Form des gemessen voranschreitenden Themas des langsamen Satzes in d-Moll, ein Variationensatz. 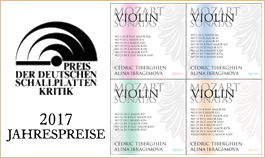 Das Thema selbst ist eng verwandt mit dem ausgedehnteren, Siziliano-artigen Thema, welches Mozart zwei Jahre später in dem Finale (ebenfalls ein Variationensatz) seines Streichquartetts d-Moll, KV421, verarbeitete—das zweite Werk aus dem Haydn zugeeigneten Quartettzyklus. Wenn das Thema in der letzten der sechs Variationen der Violinsonate in ein tatsächliches Siziliano verwandelt wird, ist die Ähnlichkeit zwischen den beiden Werken unverkennbar. Zudem findet in beiden Werken in der jeweils vorletzten Variation ein Wechsel von Moll nach Dur statt, was für warme Ausstrahlung sorgt. (Das Dur-Zwischenspiel in der Sonate ist deshalb besonders wirkungsvoll, da es auf eine stürmische Variation mit hetzenden Tonleitern folgt.) Sowohl in der Sonate als auch im Streichquartett bildet eine expressiv aufgeladene „neapolitanische“ Kadenz, die durch den Akkord der erniedrigten zweiten Stufe läuft, den Gipfel der zweiten Themenhälfte. Im Quartett verliert Mozart nach der ersten Variation diese exotische Wendung aus den Augen, in der Sonate behält er sie jedoch durchweg bei und betont sie noch in der Coda, die auf die sechste Variation (das Siziliano) folgt. Das Finale ist ein sanftes Menuett, dessen subtile Schlichtheit an den letzten Satz des Klavierkonzerts KV413 (ebenfalls ein Tempo di menuetto) in derselben Tonart, F-Dur, erinnert. Das Stück ist von einem tatsächlichen Menuett eingerahmt, dessen zwei Hälften jeweils eine ausgeschriebene Wiederholung haben, in der die Melodielinie des Klaviers von der Geige eine Oktave höher verdoppelt wird. Die kurzen Phrasen sind durch Pausen getrennt, in denen die Musik in seltsamer Weise scheinbar freischwebend zurückgelassen wird. Innerhalb dieses ruhigen Außenrahmens findet sich kontinuierlicher und animierter gestaltetes Material, und die Figuration des Mittelteils klingt in einer Coda nach und enthält einen kadenzartigen Anflug. Am Ende dient ein lang ausgehaltener Triller am oberen Ende der Tastatur als Hintergrund zu angedeuteten Hornsignalen in der linken Hand des Pianisten sowie in Doppelgriffen in der Violinstimme, bevor die Musik in einen leisen Abschluss hinabsinkt. Die Ursprünge der schönen Sonate B-Dur, KV378, sind nicht bekannt, doch kann man wohl davon ausgehen, dass Mozart sie um 1779 komponierte, als er noch in Salzburg lebte. Obwohl durchaus brillante Momente darin vorkommen, ist der erste Satz weit gefasst und recht entspannt angelegt, wobei zwischen den beiden Instrumenten ein reges Geben und Nehmen stattfindet. Zwar übernimmt das Klavier größtenteils die Führung und die Geige reagiert, doch ist es beachtenswert, dass auf das ausgedehnte Hauptthema eine sehnsuchtsvolle neue Idee folgt, die einen kurzen Abstecher nach g-Moll macht, was von der Geige initiiert wird. Das zweite Thema weist mehrere Moll-Schimmer auf und bietet eine Kostprobe des Wechsels nach Moll, der sich zu Beginn der Durchführung vollzieht. Hier spinnt das Klavier ein melancholisches neues Thema, dessen Fortsetzung von der Geige übernommen wird; und wenn sich der Eindruck einstellt, dass die folgende, aufgewühlte Klavier-Passage mit Handüberkreuzungen um mindestens eine harmonische Sequenz zu lang geraten ist, so gleicht Mozart dies mit einer verdichteten Reprise wieder aus, in der die Geige nach nur vier Takten die Führung übernimmt. Nachdem er Klavier und Geige im ersten Satz als gleichberechtigte Partner behandelt hat, erlaubt Mozart dem Streichinstrument zu Beginn des langsamen Satzes, sich in den Hintergrund zurückzuziehen. Das Klavierthema strebt hier mit gedämpfter Leidenschaft nach oben und erklingt vor einem Triolen-Hintergrund, der mit dem geraden Takt der Melodie im Konflikt steht. In formaler Hinsicht ist das Stück äußerst originell, wobei der Mittelteil und die Reprise zu einem ineinander übergehenden Ganzen verbunden sind. Jener Mittelteil beginnt mit einem unscheinbaren Geigenthema, das jedoch in der zweiten Hälfte deutlich expressiver wird, bevor die Musik (unaufgelöst) innehält und die Geige dann das Anfangsthema des Satzes übernimmt. Erst wenn dieser Teil abgeschlossen ist, kommt das Klavier wieder ans Ruder, und zwar mit einer Wiederholung des Mittelteils, in dem allerdings die Rollen der beiden Instrumente nun vertauscht sind. Um ein nahtloses Fließen der Musik zu garantieren, beginnt diese Quasi-Wiederholung mit der stärker ausgeschmückten zweiten Hälfte von dem ursprünglich neuen Thema des Mittelteils, während die ausgesparte erste Hälfte, diesmal in schlichterer Form, für den Beginn der Coda reserviert ist. Die Überschrift des Finalsatzes, „Rondeau“, weist darauf hin, dass es sich hierbei um ein Stück im französischen Stil handelt, was unter anderem einen Metrumswechsel mit sich bringt. Die ersten Partitur-Seiten, wobei der Mittelteil in g-Moll einen Siziliano-Rhythmus andeutet, weisen ein Muster von drei Achtelnoten pro Takt auf, das dann in ein Allegro in vier Schlägen übergeht, dessen prasselnde Tonrepetitionen für einen Anflug von Opera buffa sorgen. In der Reprise tritt das Anfangsmaterial noch tänzerischer auf als zuvor, was durch eine Violinbegleitung in Pizzicato-Akkorden noch verstärkt wird. In demselben Brief vom Juli 1781, in dem Mozart seiner Schwester schrieb, dass er einen Zyklus von Sonaten für Klavier und Violine veröffentlichen wolle, erwähnte er außerdem, dass er „3 Arien mit Variationen“ geschrieben habe. Es lässt sich nicht eindeutig feststellen, um welche es sich dabei handelt, doch sind die wahrscheinlichsten Kandidaten allesamt französischen Ursprungs: die Variationen für Klavier solo über ein Thema aus der Oper Les mariages samnites von Grétry (KV352) und die beiden Variationenzyklen für Klavier und Violine über Melodien aus Sammlungen, die der Kastrat und Komponist Égide-Joseph Albanèse zusammengestellt hatte: La bergère Célimène (KV359) und Auprès [bzw. Au bord] d’une source (KV360). Die Variationen g-Moll, KV360, sind nach wie vor unter „Hélas, j’ai perdu mon amant“ bekannt—ein erfundener Beiname, der jedoch auf die Melancholie der Musik möglicherweise besser passt, als der ursprüngliche Titel der Arie Albanèses. Mozart transponierte die Melodie von e-Moll nach g-Moll und sorgte damit für größeres Pathos, nahm allerdings sonst keine Änderungen vor. Im Thema und in der ersten Variation fungiert die Geige als Begleitung, tritt jedoch in der bemerkenswert chromatischen, zweiten Variation in den Vordergrund; hier betont ein wiegender Rhythmus den Siziliano-artigen Charakter der Melodie mit sanfter Leidenschaft. Nach einer entschiedeneren folgenden Variation alternieren in der vierten Variation sich kräuselnde Gruppen von Sechzehntel-Triolen zwischen den beiden Instrumenten, während in der vorletzten Variation die Melodie in Dur erklingt. Am Ende der letzten Variation scheint die Musik mit flüchtigen Arpeggien in ein Loch unterhalb der Tastatur hineinzufallen. Im Sommer 1782, kurz nachdem er Constanze Weber geheiratet hatte, begann Mozart mit der Arbeit an einer Reihe von Sonaten für Klavier und Violine, die als Geschenk an seine frischgebackene Ehefrau geplant waren. Jedoch wie so viele Werke, die er für Constanze schrieb, darunter etwa auch die große Messe c-Moll, KV427, sollten diese Sonaten unvollendet bleiben. Mozarts Manuskript der Sonate C-Dur, KV403 (welche die Überschrift „Sonate première. Par moi W A Mozart pour ma très chère Epouse“ trägt), bricht kurz nach dem Beginn des Finales ab. Der Rest des Satzes, inklusive einer umfangreichen, hauptsächlich in Moll gehaltenen Durchführung, wurde von dem Komponisten und Musikhistoriker Maximilian Stadler angefertigt, der mehrere fragmentarische Kompositionen Mozarts nach dessen Tod vervollständigte. Dieses Werk wurde erstmals 1830 unter dem Titel „Sonate facile“ herausgegeben. Die C-Dur-Sonate zeigt Mozart von experimenteller Seite. Das unbeschwerte Anfangsthema gewinnt zu Beginn der Reprise an Intensität, wenn die Violine nach Moll wechselt, was in eine längere Durchführung hineinleitet. Zu Beginn des langsamen Satzes werden die Phrasen des Klaviers von einem sanften, abwärts gerichteten Arpeggio-Motiv der Violine unterbrochen. Auf das Eröffnungsthema lässt Mozart eine emporsteigende, leidenschaftliche neue Idee in Moll folgen, wonach die Musik fast durchgehend in Moll bleibt. Eine Durchführung des Arpeggio-Motivs weicht einer längeren chromatischen Passage, die die Musik auf der Schwelle zu a-Moll balancieren lässt, bevor eine kurze Modulation direkt in das Thema des letzten Satzes, Allegretto, hineinführt.